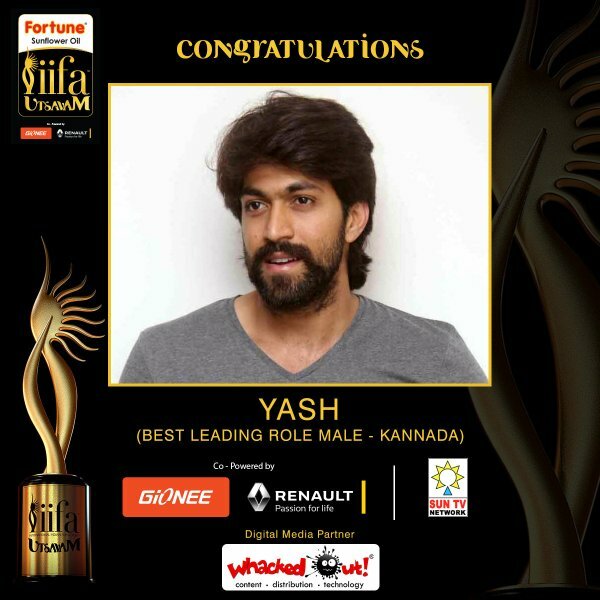 IIFA Utsavam 2016 Awards Kannada Winners List: IIFA (International Indian Film Academy Awards) for telugu movies honoured along with Kannada film industry on 26th January at Gachibowli Outdoor Stadium. The grand ceremony has been wrapped at Hyderabad on January 25th & 26th, 2016. The annual award function has been planned by IIFA south, were the first edition has successfully accomplished yesterday. The ceremony honoured to talents of South indian cinema in various category lisr best actor, actress, director and many more. The IIFA Utsavam 2016 has been given to Tamil, Telugu, Malayalam and Kannada Films. Check out below for 2016 IIFA Utsavam Awards Kannada Winners – Complete List. Stay tune here for full updates.. Check out below for full nominees list of Kannada movies in various caregory from different movies which released in 2015. IIFA Utsavam Awards Kannada Winners – Complete List 2016. The award function will be telecast on television channel soon. The satellite rights of IIFA Utsavam has been acquired by leading Kannada channel which will be reveal later. Stay tune this space for more news about IIFA Utsavam 2016.